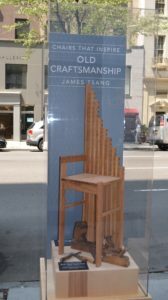 A public art project by New York’s School of Visual Arts (SVA) along Madison Avenue revealing the artistic inspiration of their students, through the medium of chairs. These 16 works of art, in Lucite-enclosed 8-foot-tall displays, are located on Madison Avenue between East 57 and East 79 Streets. The SVA’s 3D Design Program Chair and Art Directors Club Hall of Fame Laureate Kevin T. O’Callaghan, mentored the students showcased in this public exhibition.